Hanauma Bay Manager Alan Hong showed a bay-scene mural to John and Jennifer Sweeney and their sons Luke and Casey at yesterday's opening of the Hanauma Bay Education Center. 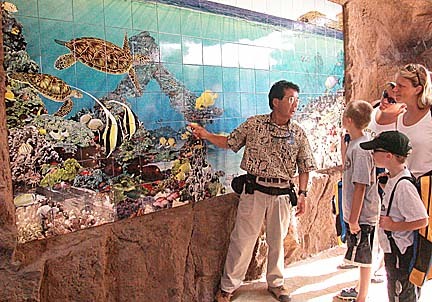 The city's $13.1 million Marine Education Center at Hanauma Bay opened to mixed reviews yesterday with some residents raving about its informative features and others complaining about inconveniences and "flaws." "It's just beautiful and educational," said retired schoolteacher Marion Yuen. "Adults and children will learn so much about the environment." She and three other retired schoolteachers visited the center and went as far as the water's edge in long pants and covered shoes. "It's good to see they livened this place up," said 31-year-old Brad Kaya, home for a visit from Japan. He had not been to the bay since he was 11. The park was closed to the public yesterday morning, and opened up to invited residents from 8 a.m. to noon to allow the city to test-run the center, which educates park visitors with a mandatory video emphasizing respect for the bay's coral reefs and other undersea life, said city spokeswoman Carol Costa. The project was completed after a 10-month delay and $2.5 million in cost overruns. Costa noted the $13.1 million project was paid by visitor fees alone. Residents are allowed in free. Tourists pay $3 each and children under 13 are free. All pay $1 for parking. New facilities include an upper-area exhibit space, a theater, an education alcove, training rooms, offices, a gift shop and a food concession, which is set to open Sept. 1. Two new trams are also included in the project. Lower bay amenities include snorkel concessions, dressing rooms, an informational kiosk, lifeguard storage and support facilities. The city used a faux-rock facade for many of the buildings to blend into the environment. "It's nice how they did it," said Donna Hopoi of Aiea. "It really blended in." Her mother, Marilyn Tsuru, had not been to Hanauma Bay in 20 years because "it's always crowded." She responded to the city's invitation with her daughter's family, whose husband and children enjoyed snorkeling in the ocean for the first time. Hopoi found the video presentation educational with its instructions not to step on the coral, but she noted many people ignored those instructions. "We find that most of our visitors are coming from places that don't have coral reefs, and don't realize how fragile they are," said Jeff Kuwabara, outreach coordinator with the University of Hawaii Sea Grant Hanauma Bay Education Program. He said a common misconception is that Hanauma Bay's reef is "90 percent dead because it's being trampled on. In reality, it's a living reef," he said. Docents did not enforce watching the mandatory video yesterday because of the number of visitors during the trial run, but it will be enforced in the future, Costa said. However, residents will only be required to watch the video once, and their names will be entered into a database. Pedro Ibarra's family was not one of the 30,000 randomly selected Oahu households to receive an invitation to yesterday's opening. Nevertheless, he dragged his wife and two teenagers from Ewa at noon yesterday and finally got to the beach at 2:45 p.m.
"It was horrendous getting in," said his wife, Val Ibarra. "We waited for hours to get in (to the parking lot)." The family was further delayed at the ticket window when her teenage children were not allowed to enter free without student IDs until she protested. Longtime supporters of Hanauma Bay, meanwhile, continued to attack the handling of the project by the administration of Mayor Jeremy Harris. Bob Kern, vice president of the nonprofit Friends of Hanauma Bay, issued a statement calling the project "seriously flawed" largely because they failed to consider input from experts and those who know the bay best, including park officials and the Friends group. Kern was most critical of the video, initially intended to be translated into seven other languages. Only four other languages are now offered. "The mayor's changes to the project have resulted in possible safety hazards, a beach area that looks like a Waikiki hotel, and an opening to commercial interests who care only about profits at the expense of the environment," he said.